New blog posts are now being published on our sister website, GetJoyfull. Hi everyone. 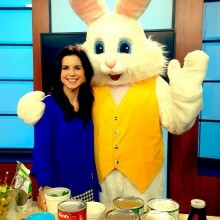 I stopped by CTV Edmonton Morning Live this morning to focus on stocking a healthy pantry. And look who I bumped into? If you’d like to see the full segment clip, click here. Hopefully you get to enjoy a long weekend. Take care.